This study has gathered information about the possibilities to reduce the number of mutilations throughout the European Union. It has focused on surgical castration of male pigs, tail docking of pigs and beak trimming of laying hens. According to literature, these mutilations have received most attention in the European Union. Furthermore, in most of the European member states these mutilations are frequently carried out. The study is performed by a graduate student of Wageningen University and commissioned by the Ministry of Economic Affairs. The conclusions of this study do not necessary reflect the official opinion of the Ministry of Economic Affairs. makers/officers, NGO’s, employees in a slaughterhouse, farmers and students across the European Union. In total 130 respondents filled out questions about at least one of the three mutilations across 16 member states (Cyprus, Bulgaria, Greece, Luxembourg, Latvia, Czech Republic, Hungary, Estonia, Lithuania, Malta, Romania and Slovenia have not taken part in the questionnaire). Parma Industry and or boar taint sensitivity as an obstacle. The Northern European and Scandinavian regions have already made some efforts on reducing the number of practices by means of non-legislative initiatives. However, the biggest problem for realizing a complete stop of these regions and an additional problem of the Central and Eastern European regions is related to the absence of (inter)national acceptance of non-castrated pigs or immunocastrated pigs, which is crucial for these exporting countries. Consequently, on-line detection methods on the slaughter line of boar taint is of high importance. A legislative approach by the national government is seen by each geography region as the most successful factor for reducing the number of surgical castrated pigs, except central European region (remains unknown). Tail docking of pigs is forbidden by national law in Sweden, Finland and Lithuania. The remaining Northern European countries do carry out this procedure on pigs, but an increasing number of legislative and non-legislative initiatives within this region show the urgency of phasing out this mutilation. 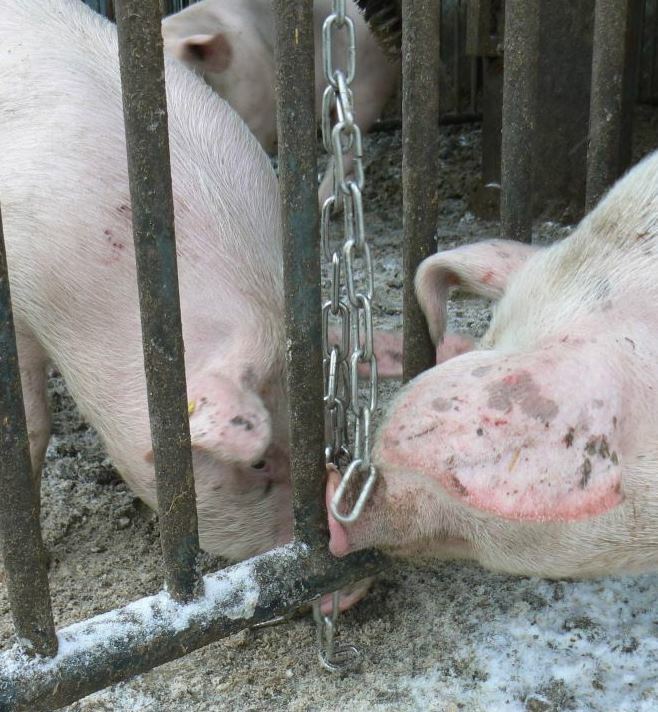 The other European regions raise also pigs with docked tails, but no active initiatives could be found that aim for a reduction of this procedure. These regions consider a lack of political interest and or consumer willingness to pay for more animal friendly products as obstacles for realizing a reduction. Moreover, each region thinks of the following animal production related factors: large stocking densities of groups of pigs, floor type of housing system used and absence and or insufficient enrichment as likely being a restriction in order to realize a reduction of tail docking. A legislation approach by the national government is the most successful factor for realizing a reduction. The Central European region is an exception, because they consider a wholesale price increase by national retailers as most successful. not show a sense of urgency for reducing beak trimming of laying hens. A lack of willingness to pay of consumers and political interest are seen as obstacles for reducing beak trimming within these regions. Furthermore, it seems that the husbandry systems of these regions are not ready yet to raise hens with intact beaks, because large stocking densities, breed and the housing system used are seen as the most frequent additional obstacles. A legislation approach by the national government is the factor with the greatest chance of realizing a reduction of beak trimming for most of the regions (Northern- and Eastern European regions remain unknown). The central European region considers the influence of large multinationals as most successful. Furthermore, the questionnaire results of the Eastern European region could not be used, it is expected that this region is not ready (yet) to reduce the number of beak trimming procedures. See also Initiatives to reduce mutilations in EU livestock production. By Spoolder, H.A.M. ; Schone, Maria; Bracke, M.B.M. 2016. Report 940. Wageningen Livestock Research, Wageningen. Which of the European member states have the potential to join the four front-runners? The European member states that have the potential to become a coalition partner of the Netherlands, Germany, Denmark and Sweden to reduce surgical castration of male pigs, tail docking of pigs and beak trimming of laying hens within the European Union. in laying hens? Other research questions are about the influence of the individual member states in the European Union and the key success factors and the biggest obstacles in realizing a reduction of each of the three mutilations within several geographic regions. This study starts with a desk research that sketches the concept of animal welfare across the European Union. The result is a framework of factors that influences the importance attached to animal welfare and is used to explain the results of the following two studies within the broad concept of animal welfare across the European Union. A second desk research focuses on retrieving in-depth information on the current situation of the member states regarding the three mutilations. Thirdly, a questionnaire was set up to get insights into which actions have the greatest chance of success and what are the biggest obstacles in reducing the number of mutilations in animals. The questionnaire was spread, by means of an introducing email, to scientific researchers, veterinarians, policy makers/officers, NGO’s, employees in a slaughterhouse, farmers and students across the European Union. In total 130 respondents filled out questions about at least one of the three mutilations across 16 member states (Cyprus, Bulgaria, Greece, Luxembourg, Latvia, Czech Republic, Hungary, Estonia, Lithuania, Malta, Romania and Slovenia have not taken part in the questionnaire). Germany, France, Italy and the United Kingdom are the most influential member states within the European Union. Furthermore, these member states, together with the Netherlands, Denmark, Spain and Poland are the biggest egg and pig producing states and or the greatest exporting countries of pork meat. A legislative approach by the national government is seen by each geographical region as the most successful factor for reducing the number of surgical castrated pigs, except the central European region (remains unknown). The majority of the pigs raised in the United Kingdom, Ireland, Spain and Portugal are entire boars. In contrast to these member states, the restrictions imposed by the Parma ham industry force the Italian pig market (and small parts of the Spanish and Portuguese pig production) to slaughter their pigs at heavy weights, which makes surgical castration the most desired option. Consequently, the restrictions imposed by the Parma Industry and the sensitivity for boar taint are the biggest obstacles for reducing surgical castration for the Mediterranean region. The Eastern European and Central European region do also nearly all surgically castrate their pigs and consider the restrictions imposed by the Parma Industry and or boar taint sensitivity as an obstacle(s). The Northern European and Scandinavian regions have already made some efforts on reducing the number of surgical castration practices by means of non-legislative initiatives. However, the biggest problem for realizing a complete stop in these regions (and an additional problem of the Central and Eastern European regions) is related to the absence of (inter)national acceptance of non-castrated pigs or immunocastrated pigs, which is crucial for these exporting countries. Consequently, on-line detection methods on the slaughter line of boar taint is of high importance. It is suggested that the United Kingdom has the highest potential to be a coalition partner of the Netherlands, Germany, Denmark and Sweden in order to reduce the number of surgical castrated pigs within the European Union. The majority of the geographic regions consider a legislation approach by the national government as the most successful factor for realizing a reduction of tail docking of pigs. The Central European region is an exception, because they think of a wholesale price increase by retailers as most successfull. Tail docking of pigs is forbidden by national law in Sweden, Finland and Lithuania. 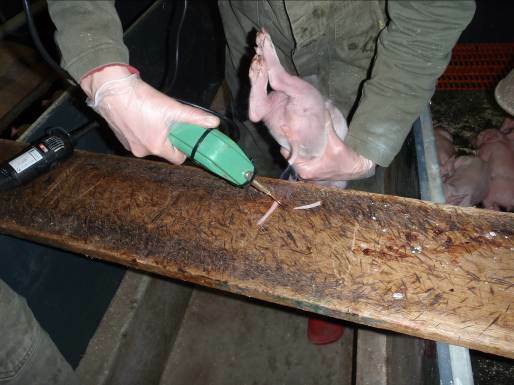 The Northern European region does carry out this procedure on pigs, but an increasing number of legislative and nonlegislative initiatives within this region show the urgency of phasing out this mutilation. The other European regions raise also pigs with docked tails, but no active initiatives could be found that aim for a reduction of this procedure. These regions consider a lack of political interest and or consumer willingness to pay for more animal friendly products as obstacles for realizing a reduction. Moreover, each region considers large stocking densities of groups of pigs, floor type of housing system used and absence and or insufficient enrichment as animal-production based obstacles for realizing a reduction of tail docking. It is expected that Finland has the highest potential to be a coalition partner of the Netherlands, Germany, Denmark and Sweden in order to reduce the number of tail docking procedures in pigs within the European Union. The Mediterranean region considers a legislative approach by the national government as the factor with the greatest chance of success in realizing a reduction of beak trimming procedures (Northern- and Eastern European regions remain unknown). The Central European region considers the influence of large multinationals as most successful. Furthermore, the questionnaire results of the Eastern European region could not be used, it is expected that this region is not ready (yet) to reduce the number of beak trimming procedures. Beak trimming of laying hens is already forbidding in Sweden, Finland, Austria and Denmark either by means of national legislation or as a voluntary ban by the poultry sector. Legislative and non-legislative initiatives aim for a stop in the near future or a reduction of beak trimming procedures within the Northern European region. The other regions do not show a sense for urgency of reducing beak trimming of laying hens. A lack of willingness to pay of consumers and political interest are seen as obstacles for reducing beak trimming within these regions. Furthermore, the husbandry systems of these regions are not ready yet to raise hens with intact beaks, because large stocking densities, breed and the housing system used are seen as the most frequent additional obstacles. Austria and Finland are suggested to have the highest potential to be coalition partners of the Netherlands, Germany, Denmark and Sweden in order to reduce the number of beak trimming procedures in laying hens within the European Union.